One of the first products I ever tried that didn’t contain all of the junk and questionable ingredients – was Dr. Bronner’s bar soap. With Dr. Bronner’s bar soap only containing a mere total of 12 ingredients and at the cost of $4.50 (US), I had to give it a try. I was immediately drawn to the blue packaging and at first whiff I fell in love with it. It was peppermint, it smelled like Christmas day — candy canes and winter. My boyfriend joked telling me that I’d smell like Santa Claus, and perhaps that is what Santa would smell like. Nevertheless, Santa Claus or not… It was so fragrant and lovely I knew I had to try it out. I brought it home and when I lathered it up, I was pleasantly surprised. The bar soap lathered beautifully and was perfect for shaving my legs, the wonderful scent filled the room and the essential oil was cooling to the skin. After my shower, I found that my skin was nicely moisturized, the scent was faint, and the cooling sensation quickly wore off. I remember thinking to myself, “How can something so natural with such minimal ingredients be so fantastic?” It was honestly hard to believe, coming from someone who used to lather Dove body wash on herself and soaking in the ridiculous amount of chemicals just to “moisturize” my skin. 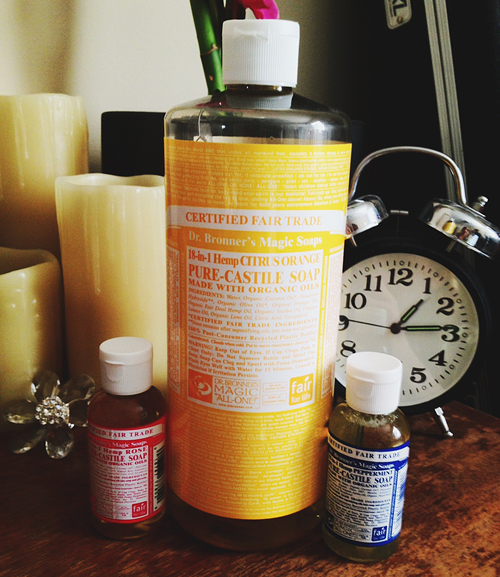 I quickly became a loyal fan of Dr. Bronner’s and was buying nothing but the peppermint bar soap to use in the shower.